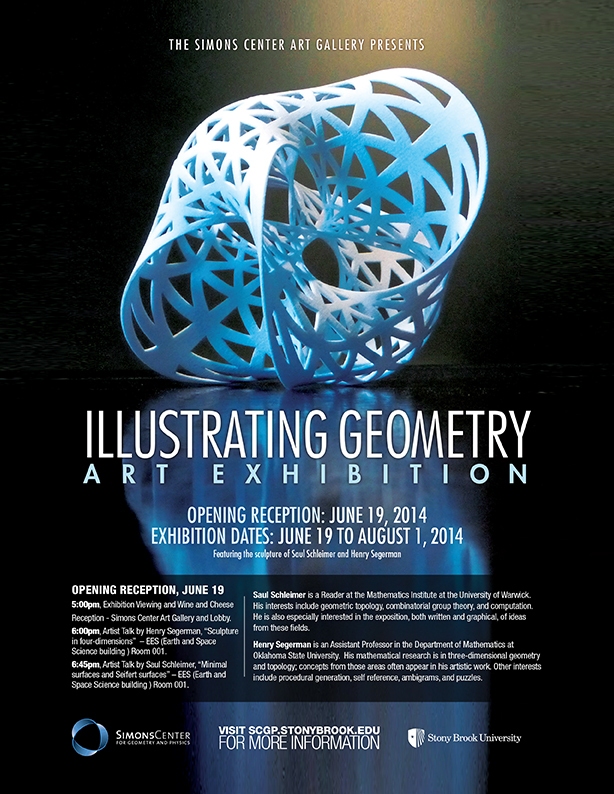 5:00pm, Exhibition Viewing and Wine and Cheese Reception – Simons Center Art Gallery and Lobby. Saul Schleimer is a Reader at the Mathematics Institute at the University of Warwick. His interests include geometric topology, combinatorial group theory, and computation. He is also especially interested in the exposition, both written and graphical, of ideas from these fields. Henry Segerman is an Assistant Professor in the Department of Mathematics at Oklahoma State University. His mathematical research is in three-dimensional geometry and topology; concepts from those areas often appear in his artistic work. Other interests include procedural generation, self reference, ambigrams, and puzzles.